7 1/2″ x 20″ is the image size. It is off center on artist board. Painted to the very edge on one side and at the bottom edge, who knows why. There is a margin on the top and on one side. Frederick Elmiger (1890-1975) was an American illustrator. 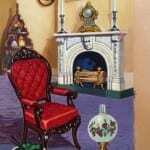 He frequently produced series on historical themes for Donald Art Company. 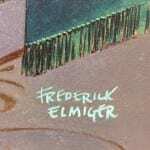 Remember that we are selling the originals of Elminger’s popular work. Buyer pays for shipping.